So… was October a trick or a treat?! With each OES we learn. We listen to your feedback and try to make the next one fit your needs even better. Some of you want more speakers, lots of activity, more interaction with each other; some of you want the complete opposite! We specifically tailor many of the sessions to different groups in attendance: athletes, coaches and team leaders, mental performance consultants, HST practitioners and media attachés. Like past OES meetings, many successful Canadian Olympians have agreed to come and share their incredible stories with you; their mistakes, their successes and their inspirations. At this OES we’ve compressed them all into two panel sessions. Come with questions – and your journal (hint- you will be given one there!). In other sessions – we believe that you are the experts and will want to hear from each other in directed and open exchanges. The program of this OES, more than ever before, is designed to encourage peer-to-peer discussion. We will have a collection of Olympic veterans and rookies in attendance. Invitations were extended to all Canadians athletes in the top 5 at their recent World Championships, Olympic medalists who are still competing and representatives from each sport. The room will be filled with others who, like you, every day believe in being the best. A note on the media summit that follows. 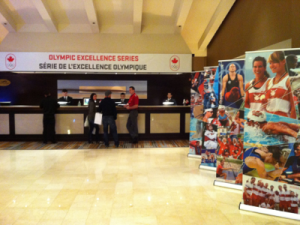 After the 2009 OES for the winter athletes about 90 athletes were able to do over 1000 interviews. They had fun and appreciated the one-stop-shopping. For you, this could mean 1000 interviews that won’t interrupt your training schedules in the coming 10 months. It’s like having your cake and eating it too! Mark Tewksbury, Sylvie Bernier and myself look forward to seeing you in Toronto (Mississauga) in 2 weeks. The London 2012 Games are going to be special. They are going to be Your Best Summer Ever so start creating your own WOW now. This entry was posted in Mentor Messages and tagged London 2012, OES by Marnie. Bookmark the permalink.